Children are such creative thinkers. And so honest and perceptive too. That’s why I enjoy visiting primary schools and public library school holiday programmes. Best of all is spending time with them in a writing workshop. In 2017, I visited some amazing schools and libraries where children have lots of opportunities for thinking creativity. 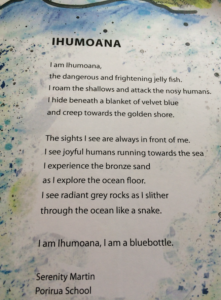 In a particularly special project, I was lucky enough to have the opportunity to work with some children from across the Te Awarua-o-Porirua catchment. 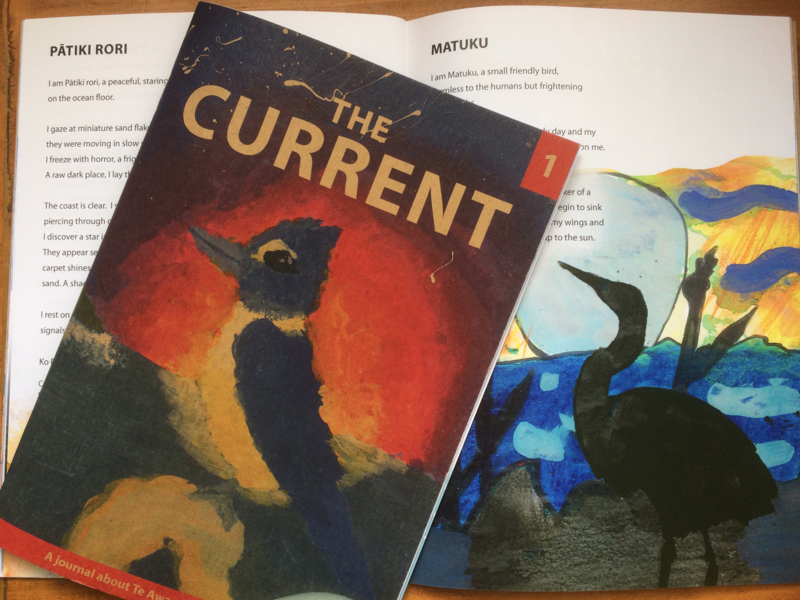 Esme Dawson from Pātaka Education Team for the Porirua Harbour Trust guided an after-school group to create a journal “The Current”, which collects together some of the best art and writing from local schools about the harbour. 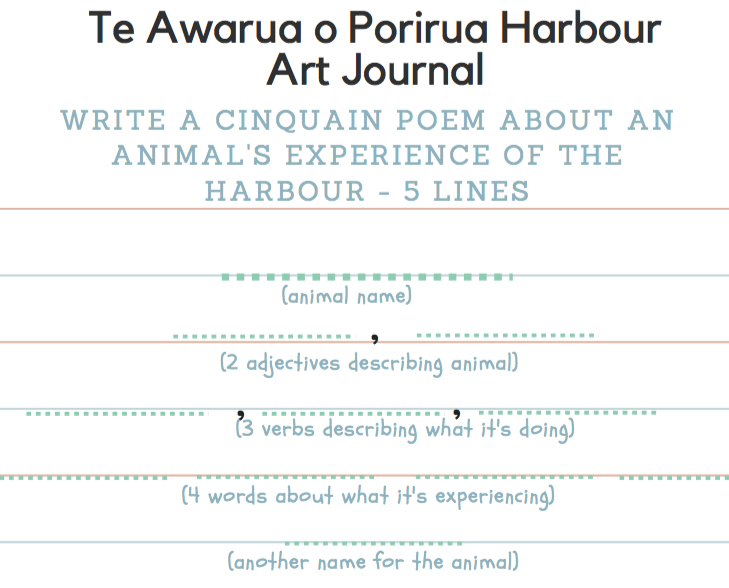 In the couple of workshops I ran, one with the group and one with a school class, we explored ways to write about the animals of the harbour. The students’ powerful writing was exciting to read and I was delighted to see the final, beautifully illustrated journal. Copies of “The Current” are in all the participating schools as well as Porirua Library. The children I worked with had already has some experience observing the harbour and finding out about what lives there. In groups, they shared their knowledge about an animal that lived in the harbour, brainstorming words and phrases that described their animal. Brainstorming is a good way to get inspiration flowing and it also helps broaden children’s vocabulary, as they pick up on words that other children are using. It’s also a good opportunity for me to go around and quietly help with spelling, because children’s spoken and heard vocabulary is usually way ahead of their written vocabulary. I take the opportunity to talk about metaphors and similies and check they know which words are verbs and which adjectives. I wanted them all to be able to finish a piece of writing in the workshop, so I chose to get them writing some structured poetry first. As an author I know that sometimes the hardest part is starting to write the first few words. A structure takes away some of the pressure and before long the young writer will find their rhythm and can leave the structure behind them. Cinquain poetry provides a simple structure. 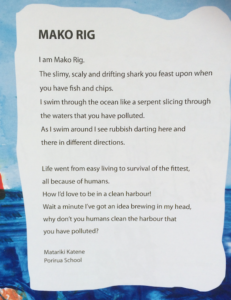 It wasn’t long before we’d transformed these simple poems into longer, powerful pieces of writing. Poetry lends itself to creative non-fiction as you can see from the examples below. 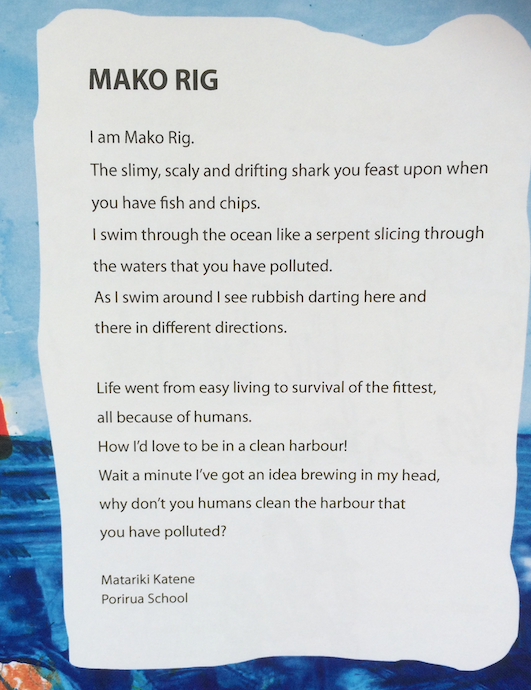 Here are two poems from students at Porirua School. the dangerous and frightening jelly fish. I roam the shallows and attach the nosy humans. and creep towards the golden shore. The sights I see are always in front of me. as I explore the ocean floor. through the ocean like a snake. 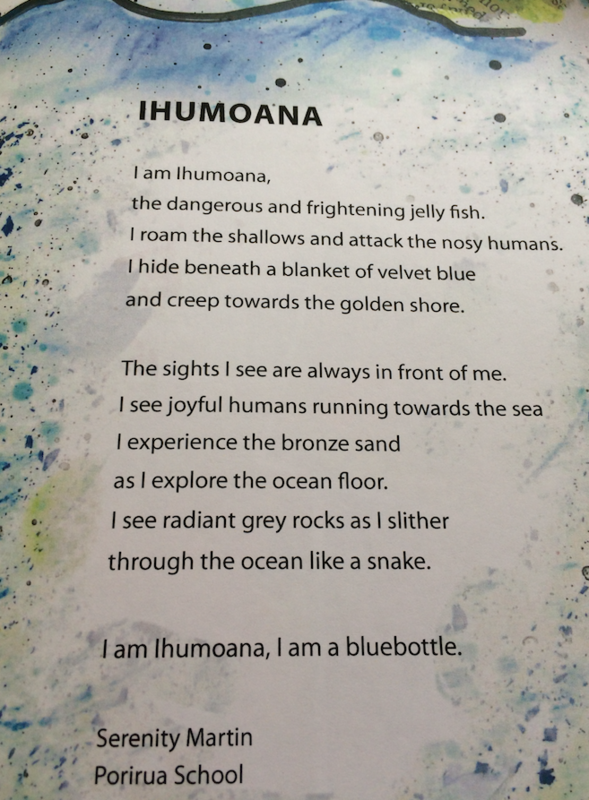 I am Ihumoana, I am a bluebottle. you have fish and chips. the water that you have polluted. How I’d love to be in a clean harbour! 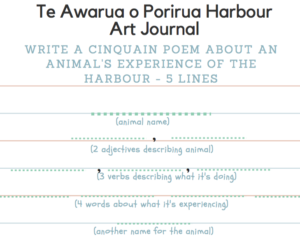 Porirua Harbour Trust have a strong education strand to their work. You can read more about their work here. For more about workshops I can offer, see here.